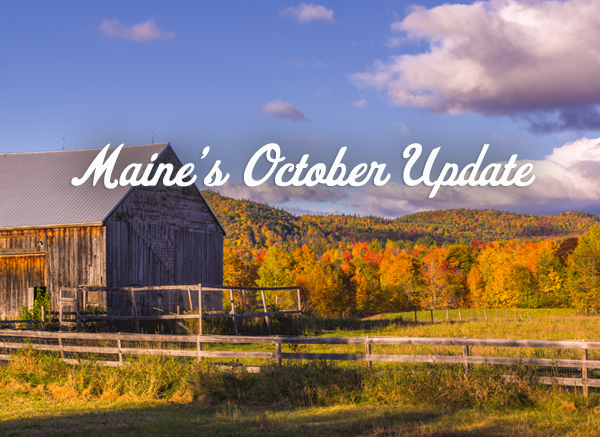 October 2018 — This is the month to head into Western Maine for a definitive foliage drive, far from the madding crowds. It’s a fine month to settle in for a long weekend at a coastal inn for one last taste of Indian summer or to check out the growing food scene in Biddeford. Later this fall, the Center for Maine Contemporary Art unveils its Biennial, the AMC lodges gear up for winter and Sunday River will be firing up its new snowmaking system. For writers, editors and bloggers looking for short-lead news, there are immediate details under Happening Now. Those in search of longer lead news can scroll down to the Looking Ahead section. For those looking to make a last getaway to the Maine coast this fall, check out Inns Along the Coast. 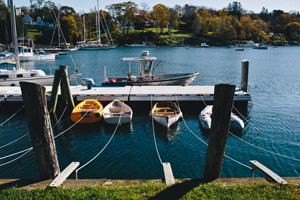 This collection of nine classic inns stretches from Kennebunkport to Bar Harbor. They include the Captain Jefferds Inn in Kennebunkport; Brewster House in Freeport; Newcastle Inn in Newcastle; Lime Rock Inn, Berry Manor Inn and Granite Inn in Rockland, Maine; Hawthorn Inn in Camden; and the Saltair Inn and Aysgarth Station in Bar Harbor. Inns Along the Coast has suggested itineraries with adventures, arts recommendations and dining suggestions along the way. Visit Inns Along the Coast for details. Portland isn’t the only culinary star on the coast. Less than an hour to the south is the city of Biddeford, where an array of eateries is putting this former mill town on the culinary map. The Palace Diner, housed in a vintage diner car with 15 counter stools, is where to start the day with the Lumberjack Breakfast (a stack of silver dollar pancakes, two eggs, Palace Potatoes and bacon, ham or sausage) and return later (any time before 2 p.m. when they close) for fried chicken, a tuna salad melt and sides of French fries or cabbage slaw. At Biscuits & Company, another breakfast and lunch place, diners can have vegetarian, vegan, and even gluten-free options. Rover Wood Fired Bagels & Pizza keeps its slogan simple: “Looks Burnt, Tastes Great!” Meanwhile, Elements is all about coffee, books and beer. Finally, Elda, which was recently praised in The New York Times, is where Chef Bowman Brown serves locally sourced small plates. Think grilled lobster with lobster-infused butter, grated cooked corn and husk cherries and you’re on the right track. Western and Central Maine offer some amazing foliage routes that are off the beaten path and well worth seeking out. For a great Western Maine loop, start in bucolic Fryeburg and head north past working farms along Route 113, through spectacular Evans Notch and the less-visited Maine portion of the White Mountain National Forest. At Gilead, head east along Route 2 until reaching the resort town of Bethel, with a host of lodging options. Drive south along route 5 to the Waterfords, which still have a 19th century feel, and carry on to the antique shop-filled town of Bridgton and back to Fryeburg. 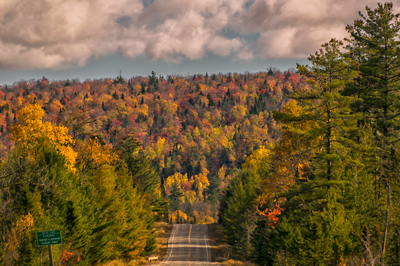 There’s also plenty of color on a drive through the Maine woods north from Skowhegan to Greenville, which sits at the foot of 40-mile-long Moosehead Lake. From Greenville, continue north on Rte. 6/15 to Jackman, and from here take Rte. 201 – a designated National Scenic Byway known as the Old Canada Road – south to The Forks. This is where the tree-lined banks of the Kennebec River offer some of the most beautiful fall foliage in the state. End with a hike to 90-foot Moxie Falls, one of Maine’s highest waterfalls. Go to Visit Maine for more fall foliage ideas. The Center for Maine Contemporary Art (CMCA) Biennial is an open, statewide juried exhibition featuring work in all mediums produced by the selected artists in the past two years. A snapshot of Maine’s vibrant contemporary art scene, the CMCA Biennial dates back to 1978 and is the longest-running juried competition in the state. Jurors for 2018 are Kate Green, guest director of Marfa Contemporary, Marfa, Texas, and Robin K. Williams, Ford Curatorial Fellow at the Museum of Contemporary Art Detroit, Detroit, Michigan. The 2018 Biennial includes the work of more than 40 artists who live either full time or part time in Maine. They include Freedom Baird, Donna Festa, Tom Flanagan, Dylan Hausthor, Shanna Merola and Suzy Spence. November 3, 2018 to March 3, 2019. Visit CMCA. Sunday River is getting ready for an epic 2018-2019 season. The resort’s snowmaking system is undergoing major renovations, effectively increasing snow-making capacity by 15 percent. 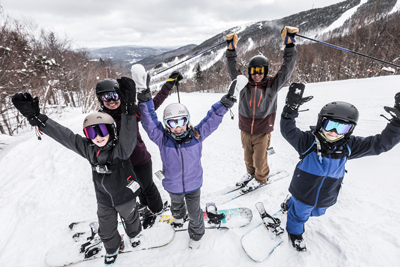 This year, Sunday River unveils its Threedom Pass™, which offers three days of skiing or riding at Sunday River to use any time throughout the winter. Pass holders can also save 40% on lift tickets Sunday through Friday and 20% on Saturdays and holidays for as many additional days as they want. Go to Sunday River for more info. The best way to explore snowy trails in the rolling, forested Maine landscape in winter? On a pair of snowshoes or cross country skies. 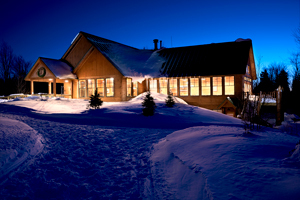 The Appalachian Mountain Club‘s (AMC) Maine Wilderness Lodges – Gorman Chairback, Little Lyford and Medawisla Lodge & Cabins – offer great skiing and snowshoeing in the heart of AMC’s 100-Mile Wilderness Conservation Lands. At day’s end, they offer the promise of a fireplace, a warm cabin and a tasty lodge meal. The lodges are an ideal combination of rustic charm and creature comforts, so expect a wood-fired sauna, hot showers, and home-cooked meals. There are more than 80 miles (130 km) of groomed trails. Guests can do day trips or even arrange to ski lodge-to-lodge. Luggage is moved by lodge staff, leaving skiers and snowshoers the opportunity to enjoy the wilderness. Visit AMC Lodges to learn more.